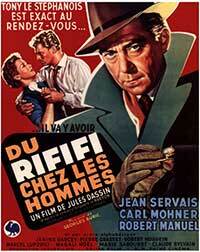 Rififi revolves around four guys who conspire to commit the perfect jewel heist. We see their preparations as they plan the heist, the heist itself and how the carelessness of the one destroyed everything they gained. In the beginning it is a little difficult to understand that the protagonists have a criminal past and that is mainly due to Jo’s parenthood and their general appearance. But as time passes their criminal tendencies become much more clear, especially as far Tony is concerned. It was very interesting watching Tony, Jo, Marco and Cesar planning and trying to organize themselves, and the scene of the heist makes the viewer very anxious about what is going to happen. I believe the after- robbery events are fascinating as well, because we notice how easy is for a person to become engulfed with avarice and make mistakes. Generally, I would not say I had any complaint with the plotline, since it was a clever concept. Τhe whole fight with Grutter was very sophisticated and presented without extraneous violence, while the ones when Tony tried to save Jo’s son were full of suspense. Tony Stephanois: He appears to be well-known in criminal circles and after he gets out of prison he has the perfect way to get into Grutter’s eye for taking Mado away from him. He appears to be ruthless and insensitive, as he beats Mado for leaving him for the gangster. He becomes the leader of the heist, after he decides to take part in it and we can see that he is respected by the other three protagonists. He is admired for his way of thinking during the preparation stage and he is considered an important member of the conspiracy, although he appears to be cruel with Mado and snobbish towards Cesar many times. He is professional at his job and he will do whatever it takes for a more risky goal, but at the same time he is very generous and loyal to his friends. Jo: Jo comes from a poor family and he is the only one of the four who has family. His little son is his weakness, which Grutter later takes advantage of to blackmail him. Although we do not see many scenes with his wife — we barely remember her — he really cares for his son and does not hesitate to give the money he took from the robbery to save his son. Mario: He is the Italian friend of Tony and Jo, and the one who suggests that Cesar help them. He is the more enthusiastic of the other two and has an amorous relationship with his wife, even though she does not know what is going on with the robbery. Both of them die in their refusal to betray the others. Cesar: Cesar is a safe-cracker and offers his useful services to the gang, because of his admiration for Stephanois. However, it is obvious that he is spontaneous and gets too easily emotional. He gets captivated by Viviane, a singer who works in Grutter’s club and does the fatal mistake to give her as present one ring of the jewels they stole. His fear leads him to spill the beans about where the money is and he finally gets punished for that by Tony. He actually represents a person of the lower-class who has perhaps less control over ones emotions, and easily makes mistakes because of his naiveté or just symbolizes the flawed nature of humanity. In my opinion, the acting was good. All the actors put in strong performances except Carl Moehner and Claude Sylvain, both of whom could have been a bit better. I felt they did not give one-hundred-percent of their skills. In terms of direction the film was great. Jules Dassin never failed to disappoint and did not allow Rififi to drag or bore. The scene of the robbery is slow-paced and tense, exactly how we would imagine and expect it to be in reality, maybe even a hyper-reality version. Also the last five minutes with the almost insane driving were shocking and unnerving, but in a well made manner. What I liked most was, in the heist scene, when we constantly see the close-ups to the protagonists faces that seem to be full of sweat, making us feel even more anxious about whether they will get away with it all or not. The best cinematographic moment was Viviane’s singing moment in Grutter’s club with all the silhouettes and shadows. We also have the chance to observe many shops, buildings or bridges around some central parts of Paris. I am very pleased with the ending, since everyone got what they deserved. The child fortunately gets back home safe and sound with Tony’s help, who ends up dying in the car. I am happy that the ending was not with him being the one who gets and spends the money, because he was the only one who did not express himself on how he would use it. He was a loner and he did not deserve to gain all the money that the other three needed more. The only thing I missed from the ending was a final scene focusing on the bag with money next to dead Tony. In this Jules Dassin classis, four men plan the perfect heist, but the interjection of human error quickly has their plans going sideways. 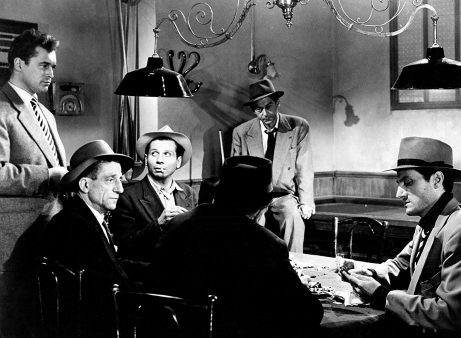 Rififi is famous for one of the most intense -- and longest -- jewel heist scenes ever set to film.